Cordoba were founded in 1997, ever since their foundation they have solely focused on delivering only the best and most valuable classical guitars on the market. A prime example for this is their marvelous Iberia series. The C3M is one of many standout performers in their line. This nylon stringed wonder is a full sized, hand crafted classical gitbox which screams of value. 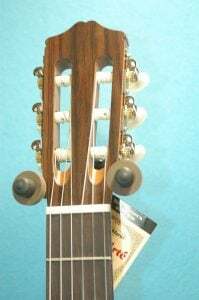 If you want an affordable instrument packing admirable qualities; Cordoba’s fiddles are some of the finest you can come across on today’s market. The C3M is simple, stylish and breathtaking – an instrument that can accompany you for a long time, especially if it’s your first of its kind. The instrument’s body features a solid top made of cedar and a hand inlaid rosette wrapped around its sound hole. The back and sides are made of all natural mahogany with a gorgeous satin finish. The git is fortified by its “Spanish 7“fan braced construction. And it’s not all about the visuals here, the tone wood mixture allows for a naturally high sustain and sound resonance. The neck is made of nato wood and it hosts the rosewood fingerboard – which is armed with 19 frets (12 to body) and a 2 inches wide nut. All of this comes on a total scale of 25.6 inches. The instrument’s hardware continues in the same fashion; scribbling quality all over its construction. The bone saddle at the bottom supports its rosewood bridge system, and waving just out of sight on the other side are the git’s six nickel tuning machines laying atop the headstock. Both hardware ends do a fantastic job at keeping the instrument’s strings in check, consenting to precise intonation. The C3M does a great job in the sound department. The tones are rich and bright, and much warmer when you compare it to similarly priced classical guitars (which doesn’t necessarily mean “better”, if you don’t like this type of sound you can consider other selections we’ve reviewed). A lively tone which stays in tune and projects superb resonance and sustain when handled correctly. If you are a guitar student, or you’re hoping to become one, I can’t recommend this more. It is a beautiful instrument which packs an avid tonal spectrum capable of pleasing you for years to come. Cordoba are geniuses when it comes to combining quality and affordability, for the money it asks of you, it doesn’t get much better than this. Beginner or intermediate – it doesn’t matter which one you identify yourself as, this gitbox offers plenty to satisfy all. More info about the Cordoba C3M, click here. 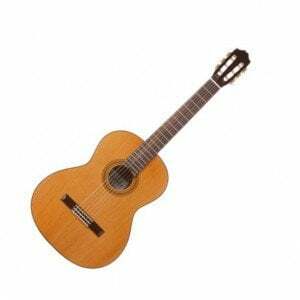 More acoustic guitars under $300, click here.